This is a gorgeous bag. I love your colour choices and the way you've designed it and then pieced it together is really unique. I think I need to give this one a try! Thank you so much! I hope you do make one. I have packed mine (2!) with so much stuff, I may need to make another as well! This is a wonderful pattern but I'm still stuck at the R51. I just cannot figure out what I'm doing to keep that row even. Do you use the long tail of the broke R50 end to change 10 and then turn and go across the main body to the last 50hdc and change 11 and then start the next line? I apparently don't understand your technique. Could you please show us how to get past that part. I love this! Beautiful color choices too. This will be on my to-do list for summer crafts. Thanks for sharing! Thank you so much for checking it out, Sherrie! It would make a perfect bag for summer. It's big enough to hold all the stuff you need when you go to the pool!! LOL!! Easy peasy, no button hole! If you make the bag, I'd love to see a picture of it. Hmmm... I just might have to give this one a try! Thanks!!! Thanks for checking it out, kpmomma! Glad you stopped by! I love this bag! I love to use big bags as purses, and this looks like it's going to be perfect for me. :) I think the only difference I'll make in mine is to put a pocket on the front. Thanks for making such a great bag & making the pattern available for free. This bag is huge! A pocket on the front is a brilliant idea, I want to add one to my bag too! Thank you for your kind words, it really means a lot to me! Very nice! I will definately give this one a try. In the same colors too!!!! Hi Anna and Vicky! I hope you will send me pictures when you're finished. I'd love to get a pattern gallery going with all the finished bags! I hope you all have an absolutely wonderful day! Oh very nice I love the colors too, I think I will give this a try. Hi Deb! Thanks for checking it out! How often do you stripe? I would like to stripe mine evenly, is it every 10 rows or what? I love this bag, I'm making mine in Stl Cardinals colors an adding the cardinals patch. Hi Trisha! Good question, since my stripes aren't done evenly. 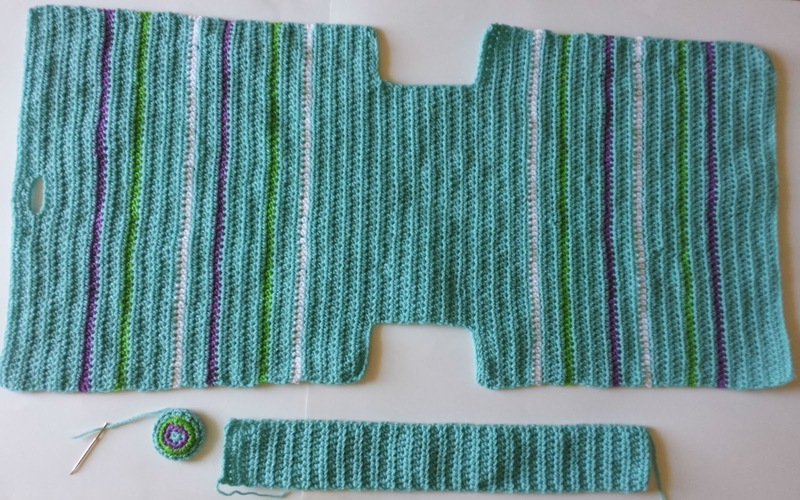 I did the first 8 rows in the main color, then I started the stripes. 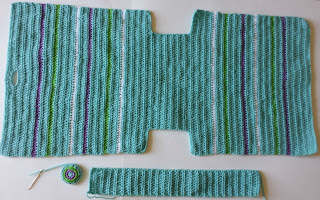 If you wanted to do thicker stripes, you could switch colors every other row, which would give you 6 coordinating color stripes (rows 9-10, 13-14, 17-18, 21-22, 25-26, 29-30)and then 10 rows to the bottom of the bag, before you start the short rows. OR, you could get a really cool bag by doing the whole thing in every-other-row stripes. There are only 40 rows on each side of the bag, so there's not much room to stripe. Are you planning to use Navy, Red and White? What did you have in mind? I'm using navy for the stripes and red for the rest. Thanks for a pattern that looks easy, practical, but pretty, too! Aw, thanks greaterexp! I'm glad you checked it out! You know, I haven't washed either of mine yet, but I made mine out of super saver acrylic, so I personally wouldn't hesitate to throw them in the washer and dryer. Okay, I will do a science experiment tonight. I'm washing and drying one. Just straight up, with the laundry tonight. I will let you know in the morning how it goes... GREAT question, Libby!!! It came out awesome!!! Perfect, the yarn looks great, and now it smells amazing too! ...not that it smelled bad before, but now it smells like fresh laundry... It's a little softer than it was before I washed it, but I like that. hehe, thanks for my points! your help was greatly appreciated and the bag is coming together great now! I'm on the strap and the button stage! Thanks again, you're awesome! Yes, someday those points are going to be valuable... LOL!!! Thanks again for letting me use your email. I would love to see a picture when you finish the bag!!! I'll put it in the Dynamo Gallery and link it to your blog, if you'd like! I will be making this bag for sure! Maybe just a little smaller, I don't carry much with me. But I still want the bag! Thank you for sharing your pattern! I think you'll be able to customize it pretty easily. If you took 15 rows off of each side, it would be shorter but it would still look good. So just skip R26-40 and R73-87... Or change it however you like... LOL!!! 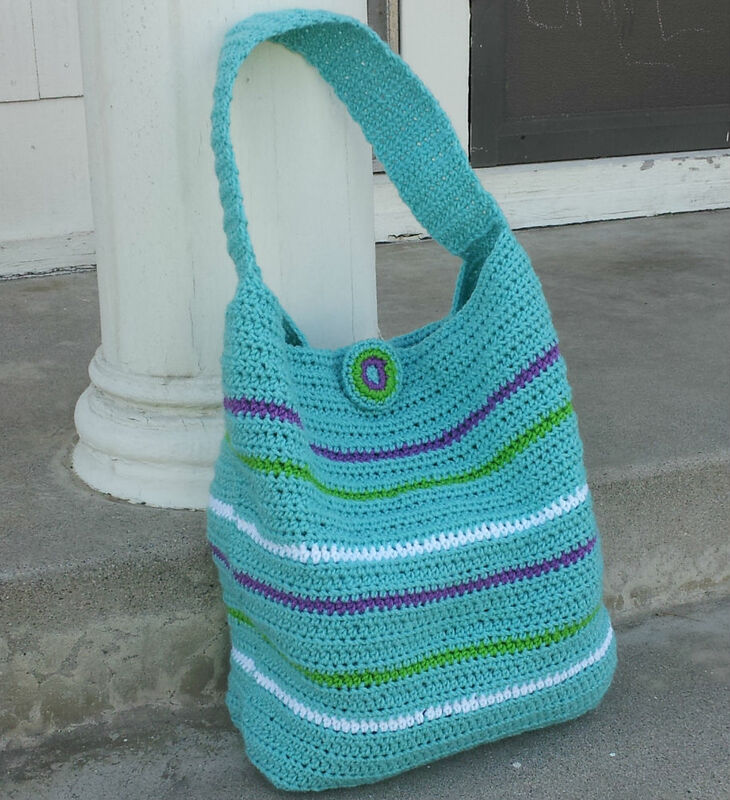 Wow thats an awesome bag.. im a beginner crocheter and it looks like something i can tackle if i go slow and row by row.. u think it would look just as good in cotton too?? thanks for shareing this !! Hi Susie! I think it would look awesome in cotton, but it will be heavy. It would be a perfect beginner project, and if you run into any problems you can always send me an email. Hi there, I have finished the body and the strap, but I am completely lost on the button. Row 3 confuses me, because I end up with 28 stiches, not 21. What I interpreted was two single crochets in one space, then 1 in the next space. Is how I am reading this wrong, since my number of stiches in the end don't add up? Sorry about the confusion, and thanks for a great pattern! Hi Eva! 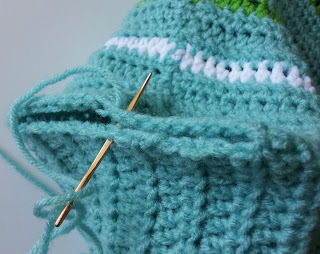 You're reading it correctly, 2 sc in one space and 1 sc in the next, which should only add 7 additional stitches to the row. I wish I could see what you've got going on there. Do you want to email me a picture? I'm still confused about Row 51. Jamie, This is your response to Ginny and Rebekah regarding Row 51. "I had you fasten off the yarn at the end of R50 so that you could start R51 by chaining 10 (a new foundation chain to add the 10 stitches back on that I had you drop off during R41). Then with the chain stitches on your hook, you're going to hdc in each stitch across the main bag body piece, and then chain 11 to finish the row. This puts the extra stitches that will become the sides of your bag back on. You shouldn't have to sew any part of the bag together, except the side seams and the handle. R51 ends with 61 stitches (10 chain st, 40 hdc's attached to the main bag piece, and then 11 more chain stitches). That's how you add the long sides back on after the shorter bottom section"
I need more clarification on this one please. After I chain 10, (which is the new foundation chain), how do I add the 10 stitches back on that I slip stitched from Row 41? Row 41 says: sl st across 10 st, ch 1, 40 hdc, ch 1, turn. Hi Wanda! Are you at Row 51? Good. This is much easier that you think. Start R51 by chaining 10 (a new foundation chain). Then with the chain stitches on your hook, you're going to hdc in each stitch across the main bag body piece, and then chain 11 to finish the row. That's it. All of 60 stitches are back on. Don't worry about what you did on R41, that was just to take them off. Okay? Hope this has clarified it for you. Please feel free to email me if you have any more questions. I just made a bag per your instructions and it came out much smaller, approx 12" tall, 14" across, and 4" deep. Also the buttonhole was huge and the button tiny so I had to add to the button. Also, to make the strap usable I ended up doing 120 rows total. I'll post a pic soon. I'm making another bag, this time with an H hook and I'll measure to 16" before I decrease; I think it'll end up being closer to 60 rows than 40. I used Red Heart Super Saver worsted weight yarn and a size G hook. Hope this helps you next time! Thanks so much for these great instructions! I'm halfway through my bag - just finished the 40stitch rows and I'm about to start the button hole side. I'm curious about something... Maybe my math is wrong... But is the button hole side 1 row shorter than the solid side? I am going to follow my pattern by rows because I used stripes... But I'm curious if i were doing solids.. It seems like row 51 is just another row of the base of the bag, plus the chains. Where row 1 is actually a full row of HDC's? Hi Jenn! LOL!! You are correct. 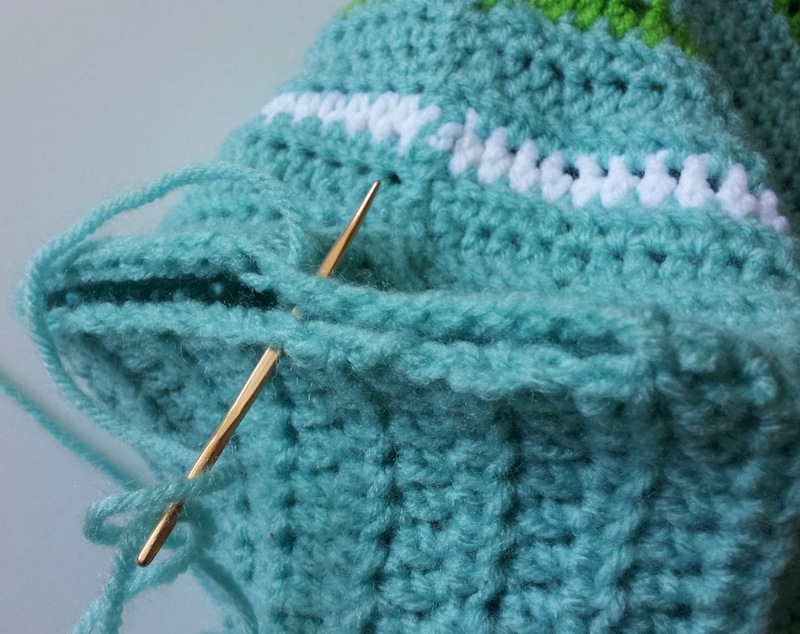 The buttonhole row kinda stretches things out at the top, so the one row difference doesn't show. If you need it to line up perfectly because of striping, you can eliminate one of the short bottom-of-the-bag rows. And it really IS way more time consuming than coasters! I noticed that in this pattern and in another pattern, you mention a "magic loop" to start your button. What is this "magic loop" you are talking about? I am making this for a wheelchair tote so I will probably use 2 handles on each side so they can be put on my wheelchair handles. I have a question. Would the bag end up entirely too gigantic if I used a size H hook instead? I'm using size G but it gets stuck in between the little strands that make up the yarn (I totally just went blank on what they're actually called). So, if I used H would it turn out okay? Hi Kaleigh! Switch to an H hook, girly! It'll be fine. Slightly larger, but not significantly. It'll be fine. Can't wait to see a pic when you're done! I appreciate the distraction! I'm supposed to working on a pattern, so I was excited to get to take a break! LOL!! Love the bag, sent you a photo, not as big as I like so planning on making another one, will line the next one. Going to do the Tardis bag for oldest daughter who is a DR Who nut lol will line it with a striped fabric in colors close to his scarf. That sounds AWESOME! I've been super-sick and haven't made it through all the emails yet. Can't wait to see the picture! Love it! I'm going to try it!! I'm new at crocheting, but I'm having so much fun looking at projects and planning for my next one. Oh, I'm glad you like it!!! Most of my patterns should be perfect for you! I love the look of this bag! I'm making mine in 4 rows of brown, 2 rows of yellow, and 4 rows of navy repeating. I am also using Red Heart super saver yarn. Except my yellow is a silky different yarn to add some texture. I was reading through the comments and I'm having the same problem someone else ran into. My gauge is too small. I have 3 inches to 10 rows and 3 inches to 13 stitches. I must crochet much tighter than you! It is 15.5 inches wide, which confuses me because I have 60 stitches and you say yours is 11 inches across the front. Will it get smaller when I sew it together with the bottom? If not, that's ok. I like a big bag! Also, I figure if I add 2 more blocks of my rows to each end of the flat bag (20 rows total) it should even out the shape. Does that make sense? If so do you agree? Thanks for a great pattern and all your extra help and advice! Hi lb91011! Ooh, your bag sounds beautiful! Okay to answer your question, yes when you sew the side seams and the bottom, that will make the front of your bag smaller (since part of the front now becomes the side of your bag). I think that the extra rows could look really cool. I would totally try it. Thank you for this pattern. I was very excited to get started on it using some leftover yarn. I was also confused on R50 but your clarification was great! My button hole also was very large but figured out something on my own that worked out (may not be done right, but it works...lol). Hi VirtuousMama! I stitched my sides together right side out, but I held them flat next to each other as I did it. I didn't include that in any of my instructions! LOL!! You didn't miss anything. If it looks better stitching it wrong side out, I would totally do that! Loved the pattern .Bag came out very well . Can we have the permission to sell what we make from pattern. Hi! I'm glad the bag turned out well. Yes, you can sell what you make with my blessing! Thank you for asking! 1st attempt was a serious fail :( Tried to double the stitch count & it made it way to big, then I whip stitched the bottom wrong, and then my strap was twisted when whip stitching it,lol. Guess I'll use it for laundry bag & try it again, only following it exactly as written. I can't wait to make this. I'm going to use cotton. I can't use super saver. It makes me itch. And I hate changing yarn so I use a lot of self striping yarn. I have a bright orange, yellow, white that will be great. Gorgeous! 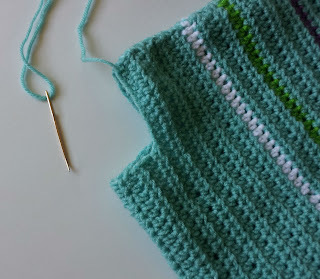 I am a beginner who has crocheted only few strips in her life, but I really love the bag and want to try it. I came upon this bag by accident and am I thrilled that I did! I am on my second one. Your directions were ingenious! I love the once piece pattern. I lined mine! First one was for me! Thanks so much for sharing this wonderful bag! Love, love the button too! I can't wait to make this bag! I have recently semi retired so i am having fun with the crocheting. For the whip stitch, do you turn the bag inside out to do it, or leave it right side out? Could we stripe just one side? I mean do you think it would look ok? Going to try it in cotton yarn......gorgeous pattern, smart lady. Love this bag - so cute!! Thanks for the great pattern. Love your colors as well. Great job! I have a problem with row 88. I assume after I get to row 88 I should still have 60 stitches across which I do. I know this sounds dumb but I am a new crocheter and still learning. If I HDC 24 stitches, then chain 12, then another 24 HDC I end up with 12 stitches at the end. Am I supposed to be counting the ch.12 has part of the 60. Whats going on? hey, can I crochet with caron cake yarn? will I need to put a lining for this yarn or will it work fine just like the super saver, without the lining. Hi, I love your London bag.One day I would like to make it. I'm very interested in your crochet towards your diploma. I've not decided yet. I need to ask if your blog is still going as I can't see any new blogs (sorry if not looking in the right place). Did you finish the whole course and how did you feel after finishing? Could you please send me the rows you changed colors on. I'm trying to figure it out from the picture, but want to be sure I fit all the colors in. I am using the same colors. I love the way it's turning out. Bless you for coming up with a simple pattern that doesn't involve making circles for the base and is all in one piece (except the handle)! Thank you so much for this pattern it's awesome.! I just finished it. I really do appreciate your explanation about the second half of the bag. Your very patient and smart. Hi. I am self taught and always wonder which side is the right side. ?